One piece gasket tiangle shape is correct, but the bolt holes dont line up when it sits on the dowels. I'm in the middle of an overhaul and have a gasket issue. 2005 Dakota slt 4.7l auto 4x4. 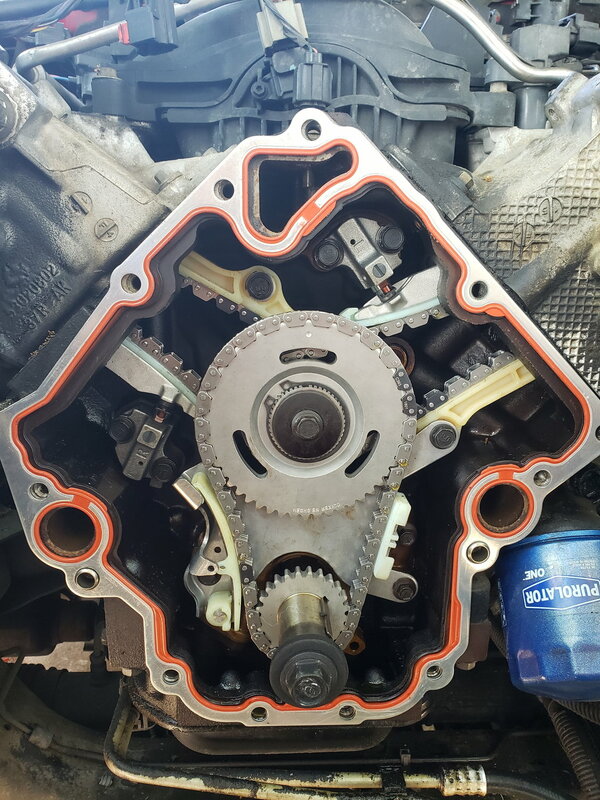 The timing cover gasket kit is 2 orings, a triangle shaped gasket (problem), front main seal, water pump gasket, and specialized rtv to seal the cover itself. The triangle kit that I got from Felpro doesnt fit into its home on the block. So then I checked out the Mahl kit, same thing. Then i bought a 1 piece gasket where the bolt holes dont align perfectly but the gasket shape is correct. Just went to the dealer who has the same shaped gasket that doesn't fit. 3 parts guys said they've never seen this problem before. He suggested I buy a new, previous generation, timing cover and one piece gasket. AllData shows the RTV going around the timing cover but still shows the 3 hard gaskets in place. There has got to be a remedy for this other than a $400 timing cover and ANOTHER gasket. Gasket is hard plastic that cant be contoured to the block surface. Last edited by Curryhurry1; 04-15-2019 at 04:15 PM. 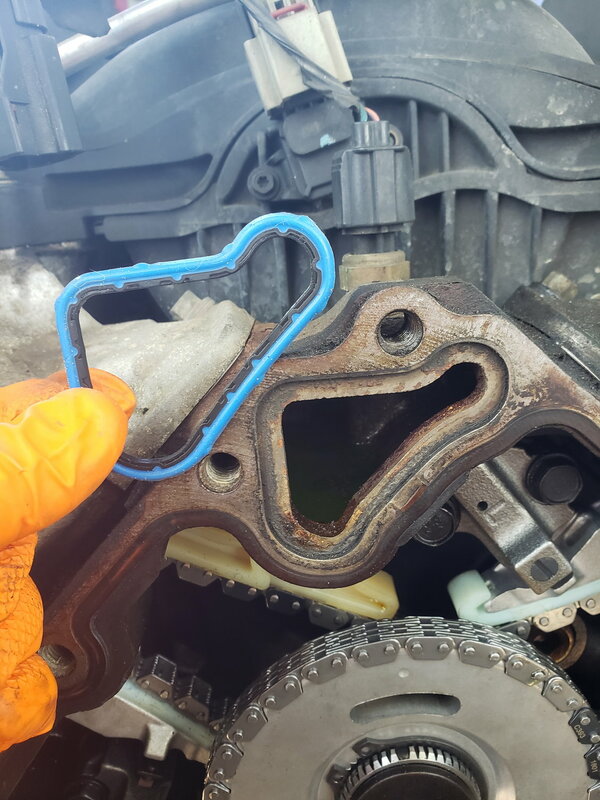 The one piece gasket in your first pic looks like it should work..... Can you put the bolts in loosely, get 'em all started, and things lined up, and then torque them down? I would not think twice about opening up the holes on that one piece until it fits. Almost looks like the holes on the gasket are misaligned - gasket matches the shape of the block on the driver's side perfectly, right to the top of the A. Human error at the gasket factory, perhaps... we all goof. Are the dowels fully seated? Looks like the holes are off a hair on the bottom. That said, I tend to agree with the other comments on here. If you can't feed a bolt through to move the hole and then tighten everything down, it's Dremel time! Sealing surfaces look like they should be okay, but you can always put some RTV around the newly opened holes if you are worried. While I wouldn't have a problem opening the holes just a bit, if you look closely at the "A" gasket, it doesnt line up perfectly the bottom right section of the gasket is actually "in" the opening and would most definitely leak. But it seems to me that the overall consensus is everybody thinks that it is just a bad gasket? I'll go up to the dealer today and order a factory one. To me it looks like the gasket is slightly out of square or tweaked just a little to the left. Will slight pressure make it line up better? The putting all the bolts in loose suggestion may do the trick.